Day 1: Arrival in Cancún, 1 night accommodation, room only. Day 2: Fly to Cuba, 1 night accommodation and breakfast next day included (recommended to visit Cabaret Tropicana at night). Day 3: Fly to Cancun, 1 night accommodation, room only. Day 4: Complete Package, advisable to add additional nights in Cancun. 2 Nights Hotel in Cancun, room only. 1 Overnight stay with breakfast in Cuba. Airplane Ticket Round Trip with Cubana Airlines departing from Cancun. 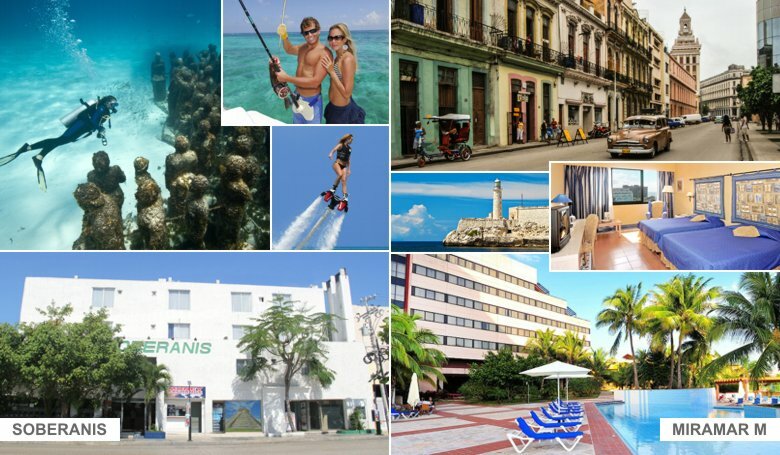 Land Transfer round trip in Havana: Airport - Hotel - Airport. Taxes: Q, TUA, UK Mexico-Havana, Leaving Havana. Taxes: $ 30 usd per person (paid in Cuba: Return). Our system allows you to add additional nights in Cancun and Cuba. To process the Cuban Tourist Visa Valid passport is required to send a copy both sides. Payment for booking: deposit or bank transfer in Mexico or charge to your credit card or debit card to Mexican or Foreign. Once the booking is confirmed by our sales department cancellations or change of name, change of travel date (valid reservation for the following 11 months from the original date of travel) applies accepted a penalty of $ 145 USD per person (this amount may vary depending on the season). The Cuban Tourist Visa is non-refundable, it is valid for five months from the date of issue. Free, Infants under 4 Years.